We’ve Integrated the Dispatch Board with Google Maps. What’s on the board…you see on the map. It’s a visual aid to show you your customers, landfills, yards, and more, on the map. We have color coded markers along with descriptive tags and balloons to explain what you’re looking at. And, you see it on Google’s Map, Satellite, Hybrid, and Street Views. The idea we went for is to be able to show you the locations of the orders you’re working with on the map. We used Google maps because we think it’s a much more state-of- the-art mapping tool… And being able to actually see the satellite and street views can be very useful to dispatchers. …And, this also applies to the filters at the top of the Dispatch Board. If you were, to say, display just the customers who needed a 20 yard container delivered, you would then see only those orders on the board, and on the map. It’s a way to see only what you want to see. A handy way for you to e-mail ticket info to your drivers. e-Dispatch gives you the ability to e-mail the ticket information to your drivers quickly and accurately. You don’t have to be at each others’ beck-and-call, or waste hours explaining and confirming details on the phone. The e-Dispatch email includes all information the driver needs to get the job done: customer info, job details, times, landfills, containers, COD info and instructions. 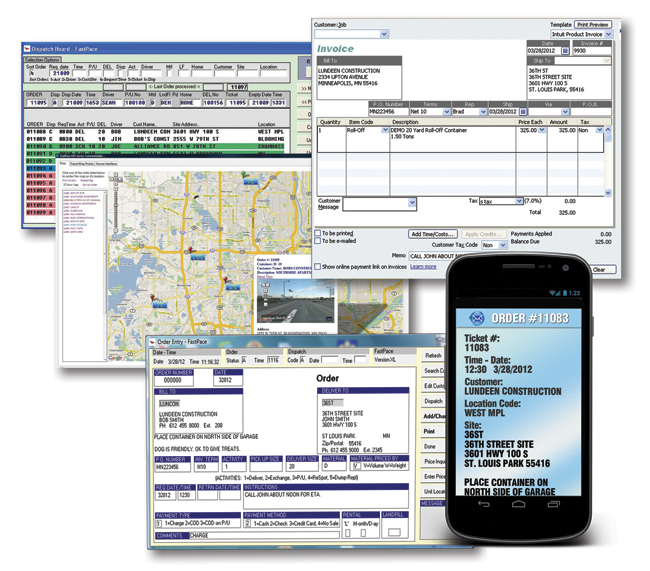 e-Dispatch is a way to communicate far more effectively and efficiently, saving time and making your job easier. Call or e-mail today for further information on FastPace and these new features.